He now admits he was wrong. Sort of. "Obviously, yeah, we had some oil, but nothing like what was being reported," said Kottkamp, who was lieutenant governor at the time of the spill. "You would have thought that the entire state was covered in oil." That comes as news to some of those who lived through it. "I've got a few pictures I could show him," said Escambia County Commissioner Grover Robinson IV, a fellow Republican whose district includes Pensacola Beach. "I was there. I saw it." Kottkamp made his original comments at an Aug. 15 Tallahassee news conference intended to introduce a new industry-backed group, Explore Offshore. The national organization advocates for allowing oil companies to investigate new places to drill in federal waters that are now off-limits. In the Gulf of Mexico, federal waters start 9 miles offshore. Kottkamp is Explore Offshore's Florida co-chair. When he claimed that offshore drilling is so safe that BP's oil didn't taint Florida's beaches, reporters asked Kottkamp how he could say such a thing given all the photos of tarballs in 2010. His reply: "Tarballs are naturally occurring." Kottkamp's comments, published by the online news organization Florida Phoenix, stirred social media outrage. Politico Florida reported he was "catching heat." The Gainesville Sun ran an editorial accusing him and Explore Offshore of using "alternative facts" to mislead the public about the dangers of offshore drilling. Frank Jackalone, director of Sierra Club Florida, scoffed at Kottkamp's effort to backpedal on his original, erroneous statement about the oil. "It wasn't an exaggeration — it was a lie," he said. 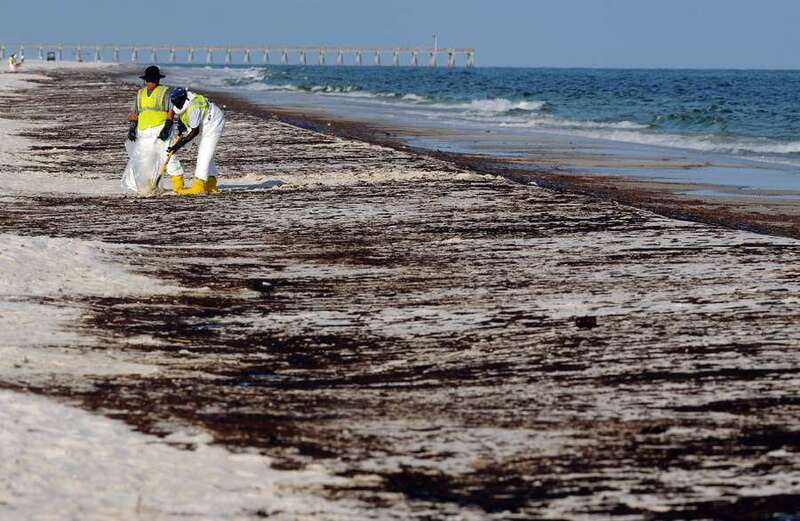 "There was oil on Pensacola Beach and Navarre Beach and Fort Walton Beach. People who saw it know better." David Mica, executive director of the Florida Petroleum Council, which is one of Explore Offshore's backers, contends Kottkamp's words were taken out of context by reporters. He agreed with Kottkamp that the BP spill wasn't all that bad. "Florida was largely unaffected," he said. Like Kottkamp, Mica said the damage done by the BP spill was due more to "a lot of bad publicity — more by perception than anything that happened. … Perception was a bigger problem than the actual oil on the beaches." As for Kottkamp's original response to the question about tarballs on Panhandle beaches, Mica said, "Well, there are a lot of naturally occurring tarballs." Five years after oil from the Deepwater Horizon disaster tainted the Panhandle's sugar-white beaches, petroleum giant BP agreed to an $18.7 billion settlement with Florida, four other gulf states and the federal government. Florida's share was estimated at $3.25 billion, about $2 billion of which was for the state's economic losses, primarily from tourism and the seafood industry. Business and local governments far from the spill indeed collected millions in BP settlement money, in part due to the tourism hit throughout the state. St. Petersburg collected $8 million, Hillsborough County $28.5 million. But Escambia County, which got more oil than any other county, was awarded $70 million. Robinson, the Escambia commissioner, laughed bitterly when told about Kottkamp's comments. First elected in 2006, he personally witnessed the damage the oil did to his region's beaches — both to the environment and to the economy as tourists canceled reservations at local hotels, charter boat captains lost customers, waterfront real estate sales fell apart and beach weddings were moved elsewhere. He suggested that Explore Offshore was attempting to make the Panhandle and its suffering seem less important to the rest of Florida than if it had hit the southern part of the state. "Pensacola Beach is just as much a part of Florida as Miami Beach and Clearwater Beach," said Robinson, who chaired the 23-county Gulf Consortium created after the spill to guide Florida's spending of the BP settlement money. Based on what happened eight years ago, he said, the Escambia County Commission is firmly opposed not only to offshore drilling but even checking to see what oil and gas resources might exist in the eastern Gulf of Mexico. "The way Florida depends on its beaches for its tourism resources, petroleum drilling is just incompatible," he said. The Deepwater Horizon disaster began with a deadly explosion on April 20, 2010, and grew worse from there. The oil rig 150 miles off the Louisiana coast — and about 100 miles away from Florida — blew up, killing 11 people and injuring 17. The rig sank, and two days later oil began gushing from 5,000 feet below the Gulf of Mexico's surface. Oil washed up on the coasts of Louisiana, Mississippi, Alabama and eventually, in June, reached Florida. Thousands of shiny, reddish-brown globs, some as big as Frisbees, tainted the sugar-white beaches across eight counties, while tar mats the size of throw rugs floated just offshore. Every day for weeks, tens of thousands of workers in hard hats, hazmat suits and steel-toed boots weaved among the stunned beachgoers, scooping up the glop. Last year the National Institutes of Health reported that workers who came into contact with the oil were more susceptible to health woes than the general population. RELATED: Seven years after explosion and oil spill, study finds cleanup workers got sicker. BP wasn't able to shut off the flow until July. An estimated 4.9 million barrels of oil had spewed out and spread through the gulf. Some of it settled on the sea floor, and there it lies still, according to studies by University of South Florida scientists. Kottkamp's boss in 2010 was then-Gov. Charlie Crist, who personally visited Pensacola Beach to see the oil. Crist, now a congressman representing the Tampa Bay area, avoided criticizing Kottkamp directly but disagreed with his comments. "It did hit the state," Crist said. "I saw it myself. … It was frightening." Seeing the BP spill and its effects convinced him to oppose any drilling near Florida, he said. RELATED: Scientists still learning from Deepwater Horizon disaster. Explore Offshore is just getting started with its national advocacy campaign. Mica, who was at the kickoff news conference in Tallahassee, contended that despite the controversy over Kottkamp's comments, "I thought it went pretty well."